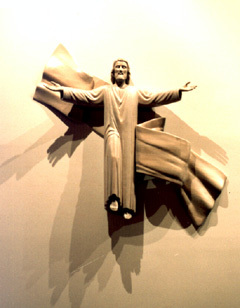 ANDRÉN & KNAPP - STATUES, "Jesus-Sugarland"
This maple Risen Christ is on the main wall of St Theresa's Catholic Church in Sugarland, Texas. we made this and drove it to Texas, attaching the drapery just before hanging it on the wall. Candy had been involved with this church many years before, before she even had met Björn. At that time she designed and built the tabernacle, confessional screen, Processional cross , a statue of Mary and a crucifix.